Susan Orlean first met John Laroche when visiting Florida to write for the New Yorker about his arrest for stealing rare ghost orchids from a nature reserve. 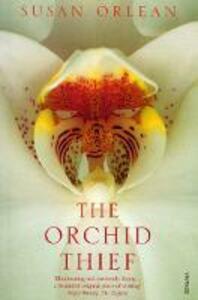 Fascinated both by Laroche and the world she uncovered of orchid collectors and growers, she stayed on, to write this magical exploration of obsession and the strange world both of the orchid obsessives and of Florida, that haunting and weird 'debatable land' of swamps and condos, retirement communities and real-estate scams. The world of the orchid hunters, breeders and showmen, their rivalries, vendettas and crimes, smuggling, thefts and worse provide the backdrop to a fascinating exploration of one of the byways of human nature, the obsessive world of the collector, and the haunting beauty of the flowers themselves.